Joel Stave, QB, Sophomore- If my opinion means anything, then Joel Stave should be the starting quarterback of the Wisconsin Badgers. He has to have the inside track for the job after the way he played in the spring game, but the new Badgers Head Coach Gary Andersen likes his quarterbacks to be mobile so it’s no sure thing. However, Stave has all the size (6’5”, 219) and arm strength a Badger fan could ask for. His accuracy impressed me as well, but he has room to grow in that area (particularly on deep balls, which he is hit or miss on). On top of that, Stave essentially saved Wisconsin’s season last year by solidifying the quarterback position and giving them a semblance of a passing game, so I trust him to be an effective starter for the full length of a season if he can stay healthy. Stave completed 58.8 % of the 119 passes he threw a year ago and started 6 games. He passed for 1,104 yards, 6 touchdowns and 3 interceptions in those games. He may not be perfect, but if the Badgers can run the ball effectively they won’t need him to be. I’ll take him over any Badger quarterback I’ve watched since I started watching college football with the obvious exception of Russell Wilson. Now, if Stave can’t stay healthy the Badgers do have a reliable option in Curt Phillips, a 6th year senior, that they can trust to take snaps at quarterback. Still, if I have to choose between Stave and “Curt Tebow” as I took to calling him during some of his late game heroics last year I’ll take Stave and not think twice. Melvin Gordon, RB, Sophomore- Gordon is a kid that I heard about during the spring game last year and I immediately was intrigued. A 6’1”, 206 pound kid with what I believe is sub 4.5 speed? Sign me up. Gordon was impressive last year and despite being behind both Montee Ball and James White he racked up 621 rushing yards and 3 touchdowns with an INSANE 10 yard per carry average. Not only that, but he added 151 yards and a 21.6 yard average per kick return as well. Gordon is an impressive back with the strength to run through tackles, impressive burst and enough long speed to rip off big chunks of yardage. He’s going to be the next great Wisconsin running back and I’ve been saying it since last August. I still feel the same way, and I can’t wait to watch him split the carries with James White this year. James White, RB, Senior- White is an interesting player, because as a sophomore he really ran into the “sophomore slump” that talented freshmen run into at times. The 5’10”, 197 pound back ran for “only” 713 yards (5.06 ypc) and 6 touchdowns after rushing for 1,052 yards and 14 touchdowns as a freshman. He got back on track as a junior, rushing for 806 yards (6.45 ypc) and 12 touchdowns despite carrying the ball less than he did as a sophomore (125 carries vs 141 carries). He’s Wisconsin’s speed back and he has legitimate sub 4.5 speed, he’s very quick, and he has surprising strength for a smaller back. Not only that, but he’s a reliable and dangerous receiver out of the backfield who figures to be featured more in this role as a senior. I like White, but I can’t quite shake that sophomore slump season from my memory despite the bounce-back year he had last year. I’m still hoping to see that absolutely dynamic freshman again, and I hope he comes back for one last hurrah this season. Jared Abbrederis, WR, Senior- Abbrederis is a player I’ve been rooting for since he was a freshman. He’s a former walk-on who actually got playing time in one receiver sets over Nick Toon even as a freshman while Toon was a junior. He’s a high effort, high work ethic player who may not be the biggest or the fastest, but he finds a way to get the job done. He’s listed at 6’2”, 188 pounds but I think he will measure in at 6’1” or maybe even 6’0” even. He’s probably going to run in the 4.55 range for his 40 yard dash time so he’s not a burner, but he runs good routes, has good quickness and reliable hands. If he gets drafted I think it will be at the end of the draft, likely in the 6th-7th round range, but it’s entirely possible he ends up signing with a team as an undrafted free agent. Still, Abbrederis has been a reliable receiver for the Badgers since he arrived on campus and he produced 49 receptions, 837 yards and 5 touchdowns last year despite the carousel at quarterback throughout the season. Kenzel Doe, WR/KR, Junior- Doe was flying under my radar as he only hauled in 16 receptions for 121 yards as a sophomore but I expect his role on the team to increase significantly this year. Doe is a dynamic threat in the slot and as a return man and I expect him to be utilized in a number of ways to take advantage of his speed. Doe is listed at 5’8”, 170 pounds, so he is quite undersized, but he has plenty of speed and quickness to help compensate for that. As a return man he averaged 27.9 yards per kick return and 12.4 yards per punt return, including an 82 yard touchdown against his new Head Coach’s former team Utah State. He had a very good spring game and I fully expect to see him as Wisconsin’s primary slot receiver, kick returner and hopefully punt returner as well. If Stave wins the job I think Doe will easily exceed his 16 receptions and 121 yards as a sophomore. Jacob Pedersen, TE, Senior- Pedersen isn’t the same prospect that Lance Kendricks was at the position a couple of years ago, but Pedersen is a poor-mans Kendricks to me. He’s not the same athlete, he doesn’t have the same upside, but he is reliable in the pass game and as a run blocker. He’s not going to be a dominant in line blocker at the next level, but as an H-Back type blocker he will be just fine. At 6’4”, 237 pounds he’s not a huge guy but he has enough athleticism for me to think he’s going to get day 3 consideration. He isn’t a flashy player that does anything spectacularly well, but he is solid in all areas. Ryan Groy, OT/OG, Senior- Groy is a player I was initially worried about sliding outside to tackle, but I think he will be able to hold up alright there as a senior. It’s tough to project how the 6’5”, 318 pounder will do on the blind side since I’ve never seen him play there, but he has enough lateral agility, good enough length and a strong enough anchor for me to think he can handle it. Originally I viewed him as only a guard, but after watching him and taking notes I think he might have a shot at playing tackle at the next level. That is all obviously projection, and I’m certainly not sold on him as a NFL left tackle, but he is carrying a day 2 grade from me into the season without a doubt. I’m excited to see what he can do, because as a guard he showed pretty good hand placement, a good anchor, and was smooth getting to the second level. He doesn’t strike me as a mauler in the run game, and is at his best when he can double team a defender, seal him off, cut him, or combo block and get to the second level. He’s not a great puller, but he looked solid when asked to do it. I think he’s going to be a good ZBS fit at the next level, and could potentially be a very good right tackle in a scheme that uses a lot of those concepts. I can’t wait to see what he can do outside at tackle this year. Rob Havenstein, OT, Junior- Havenstein was a bit of a problem area for Wisconsin’s line last year but I see potential when I watch him. The most surprising thing about the 6’8”, 342 pound lineman was how quick he was out of his stance as a pass blocker. He gets good depth, is often the first one out of his stance, and doesn’t look like he will struggle with speed off the edge if he can improve his technique over the next two seasons. He has the length, he has the size, he just needs to work on some of his mechanical issues. He ends up on the ground a lot as a result of poor hand placement and I’m not sure if he’s a natural knee bender at this point. He’s obviously huge and is effective when he blocks down on defensive tackles and can wash them out thanks to his size and strength, but he’s not great at getting to the second level. He showed some ability to recover in pass protection which was encouraging, but I’m going to be watching him closely next year to see how he does when he is tested by quality pass rushers. Kyle Costigan, OG, Junior- It’s official- the Kyle Costigan bandwagon starts behind me. I am driving it and there’s no one that can convince me otherwise. I LOVE this kid’s game. He’s listed at 6’4”, 313 pounds but he moves like he weighs 280. He is such a smooth puller, he is a text book combo blocker, he gets to the 2nd level easily, and he is a very good cut blocker. Not only that, but in the Ohio State game he absolutely held his own in 1 on 1 situations with Johnathan Hankins which is no easy task. He was only a sophomore, but he was awfully impressive to me in the games I watched. He looks like a potential 1st round draft pick if he continues to improve and get stronger. Look out for him. Dan Voltz, C, Freshman- Voltz is a player I obviously haven’t watched any of yet but the coaches seem to be high on him and he’s being pegged as a potential future 1st rounder following in the steps of Peter Konz (2nd rounder) and Travis Frederick (1st rounder, even if everyone hated the pick). He’s listed at 6’4”, 301 pounds and is supposed to be very smart based on what I’ve read about him. It’s going to be tough to pick up where Frederick left off from a football IQ standpoint but I’m excited to see what he can do as the only underclassman starting on Wisconsin’s offensive line at what some consider the most critical position. Ethan Hemer, DE/DT, Senior- Hemer is a player I’m excited to watch this year because I think the 3-4 scheme that the Badgers are installing as their new base defense will play to his strong suits. He’s listed at 6’6”, 296 pounds so he is essentially the prototype 3-4 defensive end. Last year he managed 24 tackles, 1 sack, 1.5 TFL and 3 pass defections in his first year as a starter. I expect him to be more disruptive this year and I think 3-4 teams are going to be intrigued by him as a possible day 3 selection. Beau Allen, DT, Senior- Allen is the key cog in Wisconsin’s defense this year because if he can hold up versus double teams in the middle and free up Chris Borland and Ethan Armstrong to play clean versus the run then the Badgers will be a much better defense in 2013. Allen certainly has the size to do it as he is listed at 6’3”, 335 and is one of the key players returning on defense. He managed 37 tackles, 2.5 sacks, 5 TFL and 2 pass break-ups as a junior and while I think that his statistics might not be the same as a year ago at the end of the season he may have an even bigger impact. He’s going to see a lot of double teams this year and if he can hold up at the point of attack he’s going to be very attractive to a lot of 3-4 teams at the next level. Brendan Kelly, DE/OLB, Senior- Kelly is a player I’m really rooting for because he has been through so much during his time with the Badgers. He sustained a serious groin injury as a freshman but attempted to play through it before realizing that he had torn four muscles off of his pelvis, and missed the final conference game the Badgers played that season. When he attempted to come back during fall camp the next year he aggravated the injury, leading to additional surgery and time on the sidelines. He had three total surgeries on his groin and he missed time with a hand injury as well. He stayed healthy (as far as I know) last season and the 6’6”, 258 pounder managed 28 tackles, 5 sacks, 1 TFL and 2 pass break-ups on the year. I’m not sure he’s going to be considered before the end of day 3, but the fact that he even has the chance to be drafted after all the injuries he has sustained is impressive. I’m really hoping he has a break-out year this year rotating with Tyler Dippel at outside linebacker. Chris Borland, ILB, Senior- It’s hard to believe Borland is finally a senior, but it’s happened. It feels to me like he’s been at Wisconsin forever, but now the “short not small” 5’11”, 242 pound linebacker is getting ready to graduate and attempt a jump to the NFL. Borland’s size is going to hurt him in the eyes of evaluators but he’s strong, moves well and is a very good tackler. He has exceeded 100 tackles the last two years, including 104 tackles, 4.5 sacks, 5.5 TFL and 6 pass break-ups as a junior. Borland doesn’t excel at shedding blocks and can be engulfed by bigger players at times, but he has a good motor and plays the run well. He’s a good blitzer as well, but I don’t completely trust him in pass coverage. I don’t think he’s a liability there, but I think he still has room to improve that part of his game. He’s not going to be a fit for every defensive scheme in the NFL, and many will doubt that he even has starter upside. I’ve seen him play too much to say he doesn’t, but I don’t think he’s going to be given a starting gig. He’s going to have to make the team as a likely day 3 selection and claw his way to playing time. I think he can do it though, and hopefully I’ll be able to see him show his skills at an All-Star game this winter. Ethan Armstrong, ILB, Senior- I’m not very familiar with Armstrong’s game as last season was his first as a starter, but the undersized 6’2”, 216 pound linebacker started all 14 games last season and managed 93 tackles, 2 TFL, 4 pass break-ups and an interception. I don’t think he’s the same prospect that Borland is and isn’t nearly as filled out considering he is listed as 3 inches taller than him yet he reportedly weighs 26 pounds less. If he can fill out his frame he might have a NFL future, but there’s no way he can last in the NFL weighing under 220 pounds. Dezman Southward, FS, Senior- Southward is the only returning starter in Wisconsin’s secondary but from all I’ve read about him he has really taken to his new leadership role as the veteran among the DB’s. The most surprising thing to me about Southward was that he only picked up football as a senior in high school (he previously played basketball) and didn’t even play safety. He has had to start from scratch as far as learning the game and as a fifth year senior he has only been playing the game for 6 years. The 6’2”, 213 pound safety is obviously a good athlete and he is being touted as a potential star this year. In his first season as a starter Southward totaled 69 tackles, 8 TFL, 4 pass break-ups and 1 interception from his free safety position. This year he will be expected to be even better in coverage and help Wisconsin create more turnovers. Today I am previewing the Wisconsin Badgers. The Badgers have had a fantastic run since Bret Bielema took over, particularly in the last two years, going to consecutive Rose Bowls. That’s relatively unheard of, and even though they lost both in close games it still means the Badgers are a program on the rise and that they aren’t just a big, slow team that can’t hang with East or West Coast speed. I do want to mention that while Bielema has done a good job leading the Badgers into a new era after legendary Head Coach Barry Alvarez became the athletic director, I am not quite convinced he’s the best in-game coach. Specifically, I’m talking about timeout usage. I could go on a huge rant about this, specifically relating to Bielema, but the man simply doesn’t use his timeouts effectively. Take Wisconsin’s last second loss on a hail-mary to Michigan State last season. The Spartans were content to play for OT and were going to run the clock out but Bielema got cocky and called a timeout. That led the Spartans to get aggressive and roll the dice, and we all know what happened when they did. I was so shocked by the result that I actually wrote this after the game. Fast forward to the Rose Bowl against Oregon, when a wasted timeout early in the 2nd half (this is a vast oversimplification, I just don’t want to write 4,000 words about this) left Russell Wilson without a way to stop the clock other than spiking it with under 10 seconds to go, meaning he and the Badgers didn’t have a chance for one last play to score a touchdown and win the game. I’m sure some don’t think Bielema is a bad clock manager, but those two examples are just the tip of the iceberg when it comes to Bielema and his timeouts. I’ve actually never seen or heard of a head coach who uses them more poorly and sees his team suffer more for it as a result. Anyways, Bielema sure has done a good job as a recruiter and that was evidenced by convincing Russell Wilson to transfer to the land of the cheese and he did it again with Danny O’Brien. I’m sure I’ll say this 1,000 times by the end of next season, but Badger fans please listen to me: Danny O’Brien is NOT Russell Wilson. I still believe he is a good quarterback, but like I said before last season Russell Wilson was special, and the Badgers won’t have another quarterback that good for a long time (if ever). O’Brien is officially the starter and has the unenviable job of replacing Wilson, who became a Wisconsin legend about as soon as he stepped on campus. O’Brien has the talent to keep defenses from keeping 8 defenders in the box because he will be able to make them pay thanks to Jared Abbrederis and Jacob Pedersen catching balls from him. The offensive line at Wisconsin is always impressive, and despite losing three starters they will be good again this season. O’Brien has a chance to lead Wisconsin to a third consecutive Rose Bowl. He won’t be able to do what Russell Wilson did, but he can still be a quality quarterback thanks to his experience and preference for a pro-style offense. Danny O’Brien, QB*- I watched O’Brien a fair amount as a freshman and got a chance to see two games of him as a sophomore and I didn’t see the same quarterback. I don’t think it was simply a fluke season as a freshman or a sophomore slump the next year, I think that he is a pro-style quarterback who was miscast in a spread offense as a sophomore. His freshman year he looked more decisive, comfortable and accurate. You could tell he was confident and believed that he was “the guy” when he was playing, and as a result he made plays and won games. Then they fired his HC, brought in a spread offense offensive coordinator, and tried to force a square peg into a round hole. O’Brien never looked comfortable running that offense, particularly the zone read aspect. I never saw him keep it on the zone read once, and that’s because he’s a pass first QB, not a scrambler. Defenses figured that out, and even on plays where the read would dictate pulling it and running with it O’Brien would hand it off for a limited gain. He just wasn’t a good fit for that offense, particularly from that aspect. But luckily for O’Brien, he graduated in just three years and was eligible to transfer out without having to sit for a season before playing again. That led to him being pursued by Wisconsin and Penn State very seriously, and many actually speculated that he would be going to Penn State when he took another late visit to them and was seen wearing Penn State apparel on campus. He chose the Badgers in the end, and it’s hard to say that he made the wrong decision considering all the damage that has been done to Penn State’s program. I think it’s safe to say he is happy that he decided to go to Wisconsin, and now he has a chance to start for two more seasons before heading into the NFL Draft. O’Brien isn’t a giant by any means, being listed at 6’3”, 215, but he sure makes Russell Wilson look short. O’Brien is likely only 6’2”, but that still makes him a legitimate three inches taller than the superstar signal caller that led Wisconsin back to a second consecutive Rose Bowl despite arriving just weeks before the start of the season. O’Brien is a good quarterback, but he is not the next Russell Wilson. Make no mistake about it, O’Brien is still developing as a quarterback. Wilson transferred to Wisconsin as a polished passer who probably could have left for the NFL Draft if he wanted to, and he showed what he could do when supported by a quality offensive line and running game. O’Brien was efficient at Maryland as a freshman, but the new offense and lack of quality weapons (including the loss of his go-to receiver Torrey Smith) outside of Davin Meggett certainly played a role in his down season last year. That and the fact that Maryland flip flopped between O’Brien and CJ Brown, a scrambler/option quarterback, for most of the season. 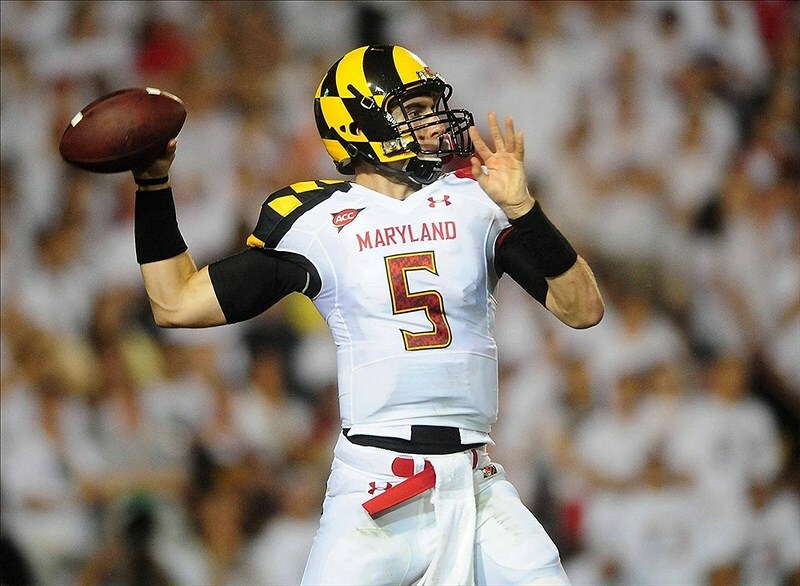 Now O’Brien has been established as the starting quarterback and he will have plenty of pieces around him to succeed. He has returning Heisman finalist Montee Ball, the speedster James White, future stud RB Melvin Gordon at running back, plus Jared Abbrederis, and Jacob Pedersen for him to throw to. When I watched O’Brien as a freshman I saw an accurate quarterback with pocket poise, the ability to throw accurately on the move (particularly to his right, as he is right-handed) and enough velocity to be a NFL starter. He doesn’t have a cannon, and his deep balls tend to have plenty of air under them, but I’ve watched him make an all-arm throw from the middle of the field to the left sideline with plenty of velocity, and that was during his sophomore season. He doesn’t have Russell Wilson’s arm, but I think it’s good enough to get a shot in the NFL. The most interesting aspect of this transfer, at least in my opinion, will be seeing how much more comfortable O’Brien will be in a pro-style offense than he was in the spread offense he was running last year. The Badgers offense has a lot of similarities schematically to the pro-style offense he was running at Maryland as a freshman, just different terminology I’m sure (as well as a bit more of an emphasis on feeding the quality ball-carriers the Badgers have in their backfield). That should help ease the transition for him, plus they have a cupcake schedule before opening Big-10 conference play with Nebraska in week 5. The first four weeks they will play Northern Iowa, at Oregon State, Utah State and UTEP. Not exactly a rough schedule, so the Badgers should be 4-0 heading to Nebraska for a big away game. He will be under a lot of pressure to be the next Russell Wilson, but O’Brien will realize that a lot of the pressure that he felt at Maryland will melt away thanks to the amazing running game the Badgers will have again this season. That offensive line doesn’t rebuild, it only reloads, so despite losing three starters (including two 1st round caliber interior linemen, Kevin Zeitler and Peter Konz) they will continue to pound the rock at an impressive clip, especially since they have a quarterback who can make defenses pay when they load up the box against their stable of running backs. I’m very intrigued by O’Brien, and I am eager to see him return to his freshman form with his second chance at Wisconsin. 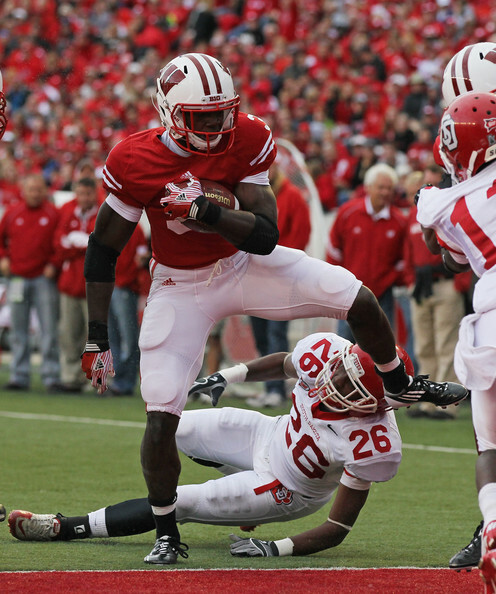 Montee Ball, RB- What is there to say about Montee Ball that hasn’t been said. He is one of the most NFL ready backs in college football, and really the only question marks people have about him are whether or not he plays behind “too good” of an offensive line so that he doesn’t really have vision or the more legitimate concern about his substantial workload at Wisconsin. Ball is listed at 5’11”, 212 and likely has 4.5 speed, but since he slimmed down before his junior season he has had substantially more burst. I thought he might have been carrying too much weight, and he always ran at one speed as a sophomore. But he was a different back, and a better one, as a junior, and it showed as he was a Heisman finalist and rushed for 1,923 yards and 33 touchdowns while catching 24 passes for 306 yards and 6 more touchdowns (he also threw 2 passes for 57 yards and a touchdown, giving him 40 total touchdowns on the season). He has the size, the athleticism, the burst, enough speed to gain chunks of yardage, the vision, the hands out of the backfield and the ability in pass protection to be a starting NFL running back right now. That’s why I thought he should declare after his Heisman caliber season last year and start getting paid for carrying the ball 300 times a year. Instead, he chose to come back, and he will certainly raise question marks about all the tread on his tires thanks to the way Wisconsin likes to run the ball. That’s really the only question mark about him in my opinion though, and there’s no reason he shouldn’t have 7-8 years of productive NFL running once he leaves Wisconsin after this season. He’s got everything you could want in a running back outside of 4.35 straight line speed. James White, RB*- James White is a peculiar player. He looked absolutely unreal as a freshman playing behind Montee Ball once John Clay went down with an injury, rushing for 1,052 yards on 156 carries (6.74 ypc) and 14 touchdowns while adding 11 receptions for 88 more yards. I thought the Badgers were going to have the best running back tandem in the country last year, but White encountered a bit of a sophomore slump and rushed for only 713 yards on 141 carries, good for a 5.06 ypc average, and 6 touchdowns while adding 10 receptions and 150 yards out of the backfield. Those are still solid numbers, particularly since he was backing up a Heisman contender, but he didn’t look like the same back at all to me. He didn’t seem as decisive, as explosive and as dynamic as he did as a freshman. I have questions about his vision and while he has plenty of speed, burst and explosiveness, I am waiting to see the freshman version of James White. He and Danny O’Brien are in similar boats, trying to recapture their freshman glory heading into their junior seasons. I don’t know if White will ever recapture that dynamic freshman year version of himself, but I really hope he does. I would draft that kid, but I’m not so sure I would draft the back I saw as a sophomore. Melvin Gordon is going to be the next feature back at Wisconsin, go ahead and put me on record. Melvin Gordon, RB**- Gordon is only a redshirt freshman this year, but I think he is going to be the next great Wisconsin running back. He only got 20 carries and rushed for 98 yards and 1 touchdown last season, but was given a redshirt after playing in only three games. Due to injuries more than anything else, he was given a chance to be the feature back in Wisconsin’s spring game and he carried the ball 30 times for 159 yards and a touchdown, surpassing the statistics he amassed in three games last year. Gordon is buried on the depth chart behind Ball, who will get the lions’ share of the carries, and White, who provides some speed that Ball and Gordon can’t quite provide, but Gordon has feature back written all over him at 6’1, 200 pounds. I can’t wait to see more of him this year, because the little that I have been able to see of him has been awfully impressive. He likely won’t get more than 100 carries this year (even that would be considerable, but it would be nice to see him get touches to help keep Montee fresh) but when he does get touches I expect him to impress. Jared Abbrederis, WR*- Abbrederis is a kid you just can’t help but root for. He emerged originally as a walk-on freshman, catching 20 passes for 289 yards and 3 touchdowns while also contributing a bit as a kick returner and punt returner. Then his role expanded even more as a sophomore with the arrival of Russell Wilson, and the 6’2”, 180 pound receiver hauled in 55 receptions for 933 yards and 8 touchdowns. He expanded his role as a return man, showcasing his shiftiness and ability to make defenders miss on the way to accumulating 315 yards and a touchdown on only 20 punt returns (15.75 average per return) as well as accounting for 689 kick return yards on 28 kick returns (24.61 average). That led to him signing his scholarship offer last January, which I was very happy to see. You love to see hard-working kids rewarded for their efforts, and not many have worked harder than Abbrederis. He may not be the biggest or the fastest, but he is a quality football player who has been a reliable target for the Badgers. He had a very unfortunate fumble in the Rose Bowl loss to Oregon late in the game, and his mistimed jump on the Michigan State hail mary helped contribute to Wisconsin’s first loss of the season. Despite those two mistakes that were magnified because of the stages on which they occurred, I am a big fan of Abbrederis. He runs solid routes, catches the ball well with his hands and uses his long arms effectively, and makes plenty of defenders miss once he has the ball in his hands. Not only that, but even as a freshman he was subbed into the game instead of Nick Toon, who was a junior at the time, when they needed a receiver to block effectively. That says a lot about his effort level and his commitment to fundamentals, and even though he isn’t a huge receiver he takes his blocking seriously. He’s a pretty complete receiver who should continue to win talent evaluators over for the next two years as a Badger. Jacob Pedersen, TE/H-Back*- Before Pedersen even became the starter I proclaimed that he would be the “next Lance Kendricks” meaning he would be a good blocker from the H-Back spot and also the primary receiving tight end. Despite only having 8 receptions as a freshman, I saw enough to project him as a quality passing option. He proved me right by catching 30 passes for 356 yards and 8 touchdowns despite only being a sophomore. At 6’4”, 240 pounds he is not big enough to play inline every down in the NFL, or even in the Big-10 really. He’s a good blocker for his size, much like Kendricks was, but he’s more of an H-Back/receiving tight end than an extension of the offensive line like the great blocking tight ends are. I have a feeling Danny O’Brien will be very happy to have Pedersen as a security blanket, I know Russell Wilson was. Ricky Wagner, OT- Wagner is an offensive tackle I’ve been talking up since Gabe Carimi was still playing on the Badgers a couple years ago. I don’t think he’s going to be a left tackle in the NFL, but I was impressed with him when I watched him a couple years ago and I liked some of what I saw of him on the left side as well. He’s not a great pass blocker, but he’s reliable and good enough to play on the right side at the next level in my opinion. The problem I have with Wagner is that even though he is listed at 6’6”, 322 pounds and he plays offensive tackle for Wisconsin, he’s not a typical road grader that you would like at right tackle. His run blocking is fine for a left tackle, but he’s not a good enough pass blocker to stick on the left side at the next level. He’s kind of a man without a home, not being a good enough pass blocker to stick on the left and not a good enough run blocker to be a great fit on the right. I am interested to see how he looks this year, as I’m hoping he will have improved in one aspect or the other (or if we’re lucky, both!) to provide some clarity about which position he projects best to in the NFL. Otherwise he might be a bit of a swing tackle that is never much more than a solid/reliable starter at either spot. I like him, but he’s not a 1st round pick at this point in my opinion. Frederick doesn’t have a ton of game experience at center (just four starts) but his combination of size, strength, and football IQ is going to make him a possible 1st round draft pick at the position. Travis Frederick, C/OG*- Frederick is a mauler in the trenches and will be moving inside to Center full time this season despite having only four career starts at the position in his first two years with the Badgers. At 6’4”, 328 pounds he is an absolute behemoth for a center, and will give the Badgers a huge advantage in the run game despite losing a great center in Peter Konz who I had graded as a first rounder. Frederick has received a lot of praise from coaches and media alike for his football IQ, and that is critical for any offensive lineman moving inside to center. The fact that he happens to have great size for an offensive guard, and the fact that he was a very good left guard last season, only means that by moving inside to center he gives the Badgers another year (or maybe two if they are lucky) of having what I call “three guards” inside. By that I mean, often times centers are very smart players with sound technique, but they are often in the 6’2”-6’3”, 300 pound mold and not particularly physically imposing. But when you have a 6’3”+ center who weighs 310+ and most importantly PLAYS as big as he is you have an advantage. Instead of having two guards and a center who can’t drive block one on one or block a defensive tackle one on one in pass protection, you theoretically have three guards who can drive a man off the ball when matched up in man blocking schemes and that really helps you generate push in the run game and dominate opponents with power man blocking. 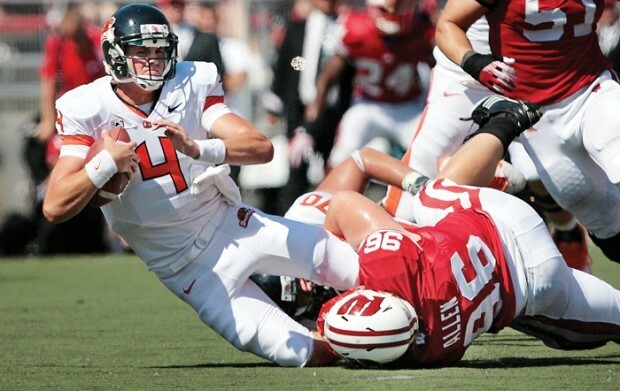 Frederick gives the Badgers a chance to do this again, and I for one can’t wait to see how he does. Centers with his skill set often go in the first round because it is so rare to find a center who can snap well, make line calls and also be big, strong and physical enough to generate push in the run game 1 on 1. That’s why centers like Nick Mangold, Maurkice Pouncey and Mike Pouncey went in the 1st round and why Peter Konz would have had he not had injury questions surrounding him. Centers that big and talented are rare and are extremely valuable commodities. The fact that Frederick combines his size, strength and technique with a high football IQ means he has the chance to be the next first round center either this year or next. Ryan Groy, OG*- Groy is the 6’5”, 322 pounder replacing Frederick at left guard and while he only has 6 career starts (including two at FULLBACK) he played in all 14 games last year and if you know anything about the Wisconsin football program you know they churn out road grading offensive lineman like a Hershey’s factory churns out chocolate. I haven’t scouted Groy specifically, but think about the left side of Wisconsin’s offensive line: LT- Wagner, 6’6”, 322 pounds LG- Groy, 6’5”, 322 pounds C- Frederick, 6’4”, 328 pounds. You think Wisconsin is planning on running to the left at all this year? Brendan Kelly, DE- Kelly is a player that before last year I never thought I might include his name in one of these prospect previews. He is a 6’6”, 250 pound defensive end who played high school football in Eden Prairie (which is about 10 minutes away from where I am currently writing this, and also was a rival team of Edina high school where I happened to go) before choosing to go to Wisconsin to play college football. He has been through a myriad of injuries and has rarely been on the field unfortunately. He sustained a serious groin injury as a freshman but attempted to play through it before realizing that he had torn four muscles off of his pelvis, and missed the final conference game the Badgers played that season. When he attempted to come back during fall camp the next year he aggravated the injury, leading to additional surgery and time on the sidelines. He had three total surgeries on his groin, he has missed time with a hand injury, and missed some time in the spring with a hamstring tweak. None of it fazed him though, as he continued to support his teammates, lift what he could lift, watch film, and continue to demonstrate an intense passion for the game of football. He has fought through a lot of adversity to remain on this team, much less play, and I find myself rooting for him to stay healthy this year and show what he can do. He played in all 14 games last season as a junior, and totaled 35 tackles, 2 TFL, 3 sacks, 1 pass break-up and 2 forced fumbles. It wasn’t as if he got those sacks against bottom feeders either. His three sacks were in three different games, coming against Nebraska, Michigan State and Ohio State. He started the final 8 games, his first coming against the Cornhuskers. The Badgers will use a rotation along the defensive line, but Kelly is expected to get a lot of snaps. He also has the potential to petition for a 6th year of eligibility thanks to losing almost three full years of his career due to hand and groin injuries. We’ll see if he gets that, but I am looking forward to seeing if he can help Gilbert boost the Badgers’ pass rush this season. They could really use it. David Gilbert, DE*- Gilbert flashed some potential to me as a sophomore because the 6’4”, 250 pound defensive end showed an impressive get-off as well as burst and speed to get the edge. He’s an impressive looking athlete, and he had 3 sacks in Wisconsin’s first four games last year (though they played UNLV, Oregon State, Northern Illinois and South Dakota in the first four weeks, with Gilbert getting a sack in each game except for the NIU game). However, he sustained a serious foot injury and was granted a medical redshirt to preserve his junior year of eligibility. He’s very strong, and he has all the physical tools you could want to be an effective defensive end. I want to see him play smarter, improve his technique and prove that he’s more than just an edge rusher with a bit of a bull rush. If he improves his technique and continues to improve his craft as a defensive end he could get 8-10 sacks this year or the next and boy do the Badgers need a pass rusher. They have really missed the pressure J.J. Watt put on passers. I honestly believe that Beau Allen could be the best defensive tackle the Badgers have had in years. Beau Allen, DT*- I haven’t scouted Allen specifically, but the 6’3”, 323 pound defensive tackle gives the Badgers some much needed size in the middle of the defense. As a sophomore he had 22 tackles, 4 sacks and 1.5 tackles for loss despite not starting a single game because he was playing behind Patrick Butrym. I was never a Butrym fan, so I am interested to see if Allen can be a superior talent. Wisconsin fields three undersized tackling machines at linebacker, so they need their defensive tackles to occupy blockers and allow them to fly around and make plays without being reached by offensive linemen. If Allen can keep his linebackers clean and also apply pressure on the passer like he did in a rotational role last year he is going to get a lot of attention from scouts. I can’t remember the last time the Badgers had a quality pass rusher at defensive tackle, but I think Allen has a chance to change that. He has already shown signs of being an impact player, such as totaling 3 tackles for loss and a sack in Wisconsin’s 2012 Spring Game. Ethan Hemer, DT*- Hemer is another big, strong defensive tackle who will be starting at nose tackle I believe. He is listed at 6’6”, 305 pounds and by playing next to Allen I believe he gives the Badgers the biggest defensive tackle starting tandem that they have had in some time. Like I just mentioned, they need big defensive tackles to keep their linebackers clean and I am eager to see if Hemer is up to that challenge. He comes into the season with 20 career starts, including all 14 games last season, and he managed 34 tackles and 1 sack in those 14 starts. I don’t need him to make 100 tackles, 15 sacks and force 5 fumbles (though that would be terrific) but he needs to show that he can hold up against double teams and help clog up running lanes in the middle of the defense. Nose Tackles that can do that are very valuable in the Big-10, and just as valuable in the NFL. Chris Borland, MLB*- Borland is just a beast, I know that word is overused but it’s true. I remember when I was watching him as a freshman (god that feels like a long time ago) and even though he is probably only 5’10”, 250 pounds (yes, he’s listed at 250 pounds, though he’s also listed at 5’11”) he plays very instinctually, flies to the ball and is a tackling machine. He was second on the team in tackles with 143 tackles, led the team by a wide margin with 16.5 TFL, had 2.5 sacks, 5 pass break-ups, 2 interceptions and FIVE forced fumbles. Make no mistake about it, Borland is a man who can stuff a stat sheet and he really has a knack for forcing fumbles. His freshman year in 2009 he only had 54 tackles (36 solo), but he had 10.5 tackles for loss, 5 sacks, 1 pass deflection, 1 interception, a blocked kick and five more forced fumbles! He got a medical redshirt in 2010 and came back at full force as a redshirt sophomore as you all know. He enters his junior year with 28 career tackles for loss, 7.5 career sacks, 3 interceptions and a staggering 10 forced fumbles. He’s undersized and he won’t be able to play middle linebacker in the NFL, but I think he will get a shot to play outside linebacker in the NFL. Maybe it will have to be in a Tampa-2, but he is too instinctual and too good a tackler to not get a NFL shot. Mike Taylor, OLB- Taylor is taller than Borland at 6’3” but despite being listed four inches taller he weighs 28 pounds less, listed at only 222 pounds. That’s pretty light even for a weak side linebacker, but he produced anyways as he led the team in tackles (which is no easy task playing next to Borland) with 150 tackles, 7 tackles for loss, 2 sacks, 3 pass break-ups and 2 interceptions. He’s a senior this season and figures to help Wisconsin have one of the best, if not the best, linebacker tandems in the entire Big-10 conference. If the defensive line can keep him and Borland clean they are going to wreak a lot of havoc on opposing offenses, you can count on it. Shelton Johnson, SS- There is actually a fair amount of potential in the Badgers’ front 7, more than I expected and more than they have had since they had J.J. Watt leading the charge to the Rose Bowl against the TCU Horned Frogs. The Badgers had a lot of trouble on the back-end last year though, even in spite of having two well established senior starters in Antonio Fenelus and Aaron Henry. Now they have both moved on to the NFL, and Shelton Johnson is the only, yes ONLY, returning defensive back that had an interception last season. He had four of them along with 54 tackles, 6 tackles for loss and four pass break-ups, so I think he has a chance to be a reliable safety in his second season as a starter, but the lack of talent around him is extremely concerning. The only returning defensive back besides Johnson with an interception in his entire career is Devin Smith, who has three, and he sustained a season-ending injury last season that earned him a medical redshirt. Johnson is going to be the best player in this secondary, and if a Smith and Marcus Cromartie don’t step up at corner this pass defense is going to struggle mightily, particularly with big plays. That is, unless the pass rush improves considerably. The defensive secondary will be the kryptonite of this Badger squad, but Johnson has a chance to help stop some of the bleeding. Obviously Wisconsin was in control of this game from start to finish, as they scored within the first three minutes of the game with a powerful running game and a dangerous play action fake. The thing that stuck out to me more than anything else was Montee Ball’s overall speed/quickness. He looked much more explosive, much quicker and displayed significantly more burst than he ever did last season. That was fantastic to see from a scouting perspective. The announcers drove the point home that he lost about 28 pounds this offseason, so obviously he is in pretty incredible shape and is moving much better as he is carrying less weight. That means Wisconsin’s backfield is going to be terrifying because James White continued to look excellent as expected (he still reminds me a lot of Warrick Dunn) and Melvin Gordon looked effective as a possible #3 back. Obviously Russell Wilson was a player you have to key on because of his ability to sling the football all over the field as well as his athleticism, and he definitely didn’t disappoint. He was 10/13 for 255 yards (19.6 yard average), 2 TD’s plus 2 carries for 62 yards and a touchdown on a 46 yard scramble just before the end of the second half. He was awfully impressive, though two of his incompletions were passes that I would expect him to make most of the time. But his arm strength, accuracy, intelligence, athleticism and poise were on full display tonight even if the opponent wasn’t much of a challenge. He had great pass protection the whole night, and when the pocket did eventually break down a couple of times he gashed UNLV’s defense with improvised plays. He was extremely effective for having been on campus for only two months. It speaks volumes about him that he was able to adjust and adapt that quickly, not to mention that he played great and was voted as a captain by his teammates. Nick Toon was only targeted a couple times tonight but he made two tough catches in traffic which was good to see. He and Jared Abbrederis have the most to gain from Wilson’s presence this year because they will see a lot more targets and downfield passes because of his ability to buy time in and out of the pocket and because of his significant arm strength. Jacob Pedersen was also targeted a couple times and I really think that he is going to surprise a lot of people. He’s got a ton of athleticism and upside. The offensive line looked great to me. Obviously Oglesby isn’t the strongest part of that offensive line, but I am extremely high on Ricky Wagner (LT) and Peter Konz (OC). I also like Travis Frederick and Kevin Zeitler, though this was the first I’d seen of Frederick since he was redshirted last year. Oglesby has his moments in the run game and looked alright in pass protection, but I am going to wait to pass judgement until he deals with players with more edge speed and quickness which he really tends to struggle with when pass blocking. His feet are slow and he doesn’t seem to have much ability to recover quickly and re-establish fundamentally sound mechanics. I love Wagner and Konz though, and both looked great tonight when I paid attention to them even if it was against less than comparable competition. Louis Nzegwu flashed some potential at DE for Wisconsin as did David Gilbert, though I think Nzegwu is the better player I think Gilbert has more upside because of his size, speed and strength combination. He flashed some serious speed off the edge last year and showed that again in this game, but he just needs to improve his hand usage if he is going to provide anywhere close to the pass rush that J.J. Watt did from that same position last year. Defensive tackle was a concern of mine for the Badgers coming in and that held to form as they got gashed versus the run, whether it was inside or outside in this game. That speaks to the linebackers as well, but they looked pretty weak up the middle to me and Gilbert did not impress me much versus the run, though I would need to re-watch the game to get a more accurate feel for that. I think the Badgers are really going to struggle to stop teams like Nebraska and Michigan State on the ground if they gave up 146 rushing yards to UNLV. Antonio Fenelus impressed me in the secondary for Wisconsin. He was called for pass interference on a play when he had perfectly fine coverage, located the ball and was making a play for the ball in the air. I thought it was a bad call, there was contact, but it shouldn’t have been a penalty. I think he has some significant upside, and I’m excited to watch him this year. Devin Smith, their new starter at corner, didn’t fare as well. I don’t think he has much upside in the NFL, and at this point he’s probably a late round/free agent guy based on what I’ve seen of him, though he is fundamentally sound for the most part. He just doesn’t have what it takes in coverage in my opinion. I’m also not that impressed with Aaron Henry. I didn’t pay attention to him at all (he might not have even played for all I know) but he strikes me as an average FS in the NFL. Not very fundamentally sound and doesn’t seem to have very good instincts in my opinion. For UNLV I wasn’t very impressed with their QB Caleb Herring. He looks very skinny and he has a bit of a goofy throwing motion, and isn’t overly accurate. However, he did throw a couple nice balls and I liked some of what I saw from Phillip Payne. He dropped a pass or maybe two, but he made a couple nice catches in traffic and had one of UNLV’s two touchdowns on the night. It’ll be interesting to see how he does this year. So overall I was impressed with Wisconsin, but their run defense and their kicking game is going to hurt their chances at winning the Big 10 with Nebraska and Michigan State both posing legitimate threats with very potent ground games. They have a good chance with Russell Wilson, but their run defense was a weak spot that needs to be improved upon to hold up week 5 against Nebraska, and if they are in close games and they are relying on a kicker who can’t make all of his extra points they could be in for a couple tough losses.